It's Spring! No, wait. It's Autumn! No, wait. 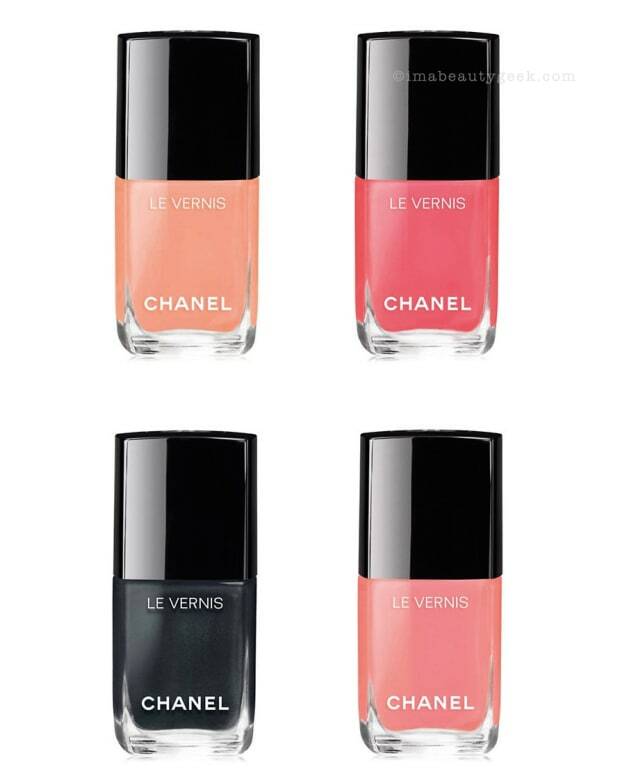 It's Chanel's newest nail polish shades, including a limited-edition neon! Hi friends! 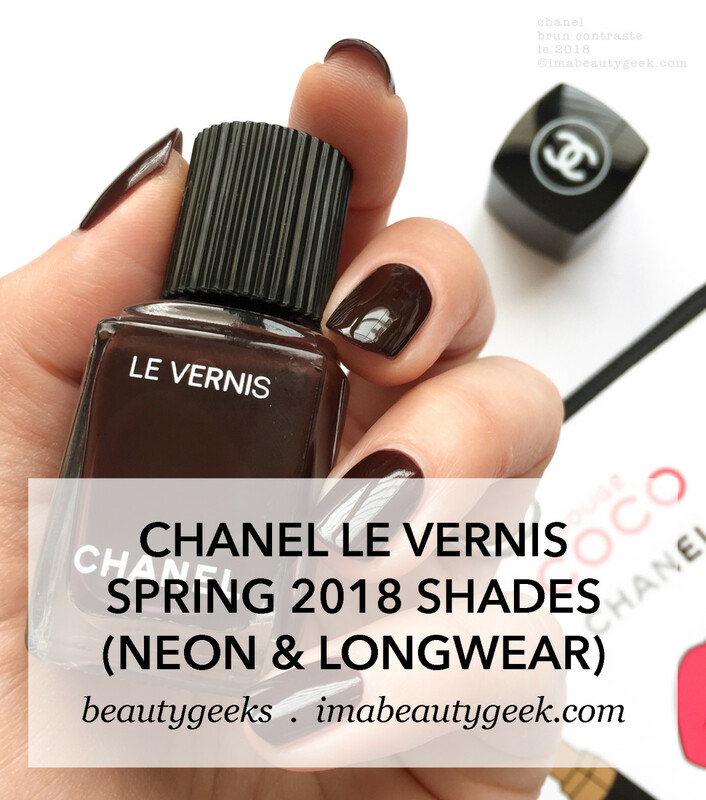 I made you some swatches of the latest Chanel 2018 Vernis shades! Four of these pretties, including a limited-edition neon, landed on mah desk and seeing as I haven’t played Chanel for a while, I figured I’d give ‘em a whirl. And colour me surprised! I loves them all! Let’s look! 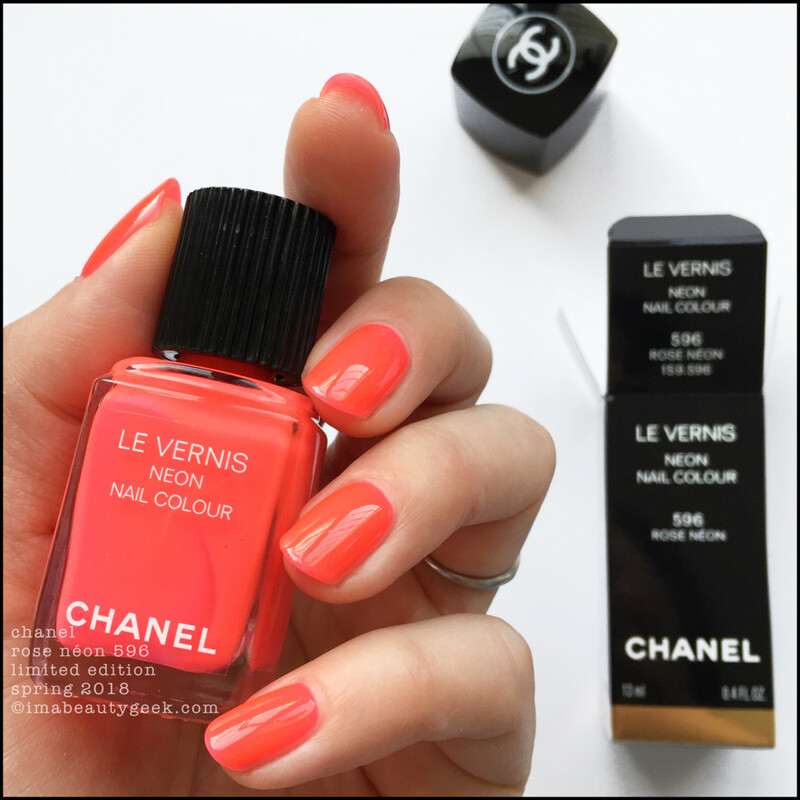 Chanel Rose Neon 596 – limited edition 2018 (above). If you’re on my side of the screen on an iMac calibrated to medium brightness, this photo is 100% colour correct. It’s not exactly a neon, but it’s a juicy thing that took 3 coats to get to opaque. Cheery, and bright, it might be a little more summer than spring but hey, after the winter we’ve had in Toronto, I’ll take it! Note: this is one of two Spring 2018 limited-edition neon shades from Chanel. The other is Chanel Scenario 604. 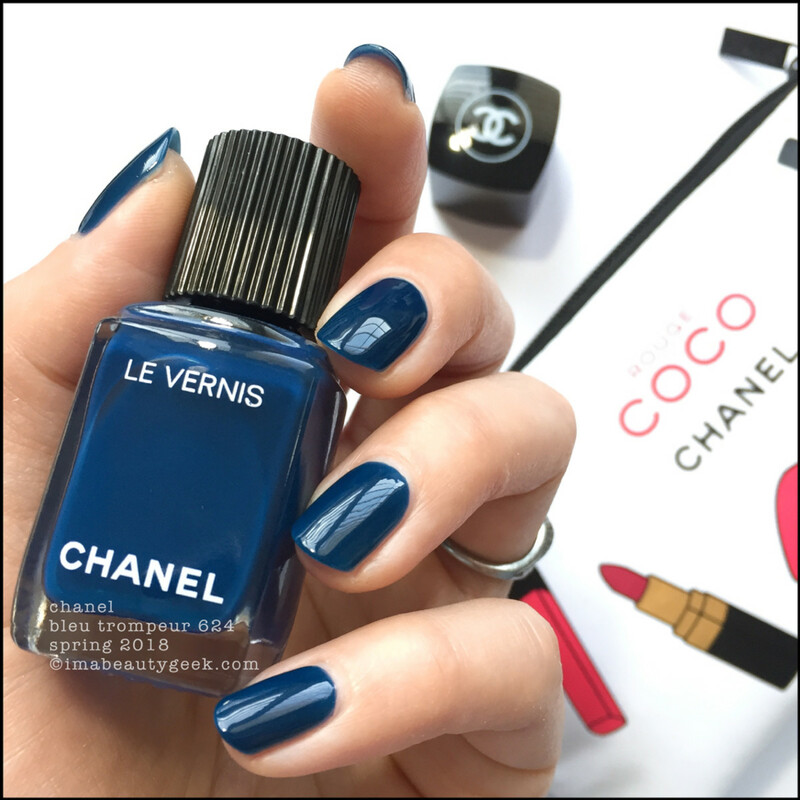 Chanel Bleu Trompeur 624 (above). Gah! What a lovely denim blue! That’s 2 coats to opaque and the formula is a little bit crelly and a whole lotta love. It’s been a little while since I’ve had so few issues with the latest brush/formula combo but I’m thinkin’ that Chanel has nailed it with these new shades! 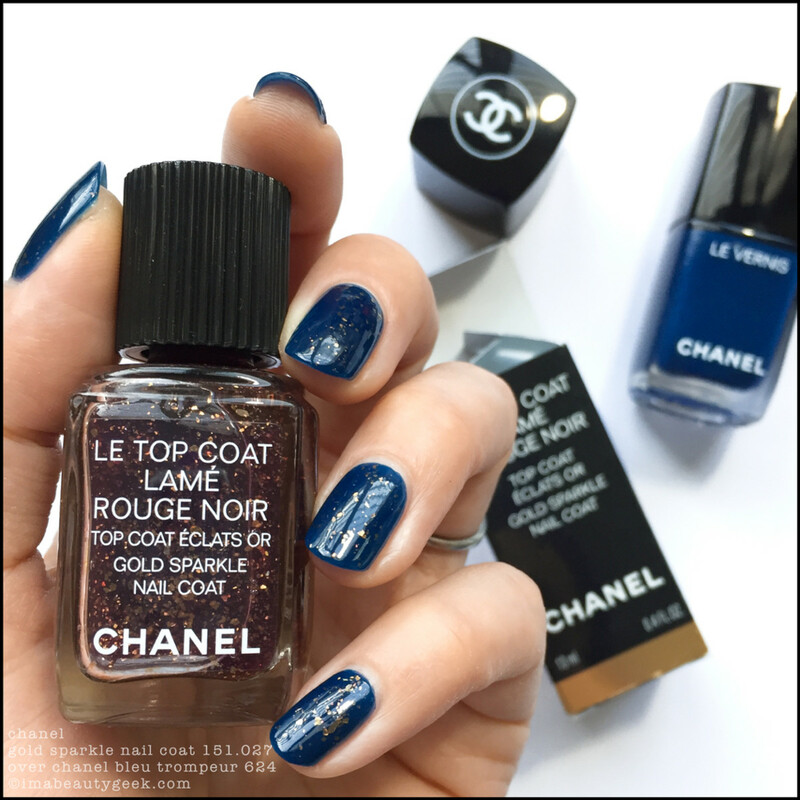 Chanel Gold Sparkle Nail Coat over Bleu Trompeur 624 (above). 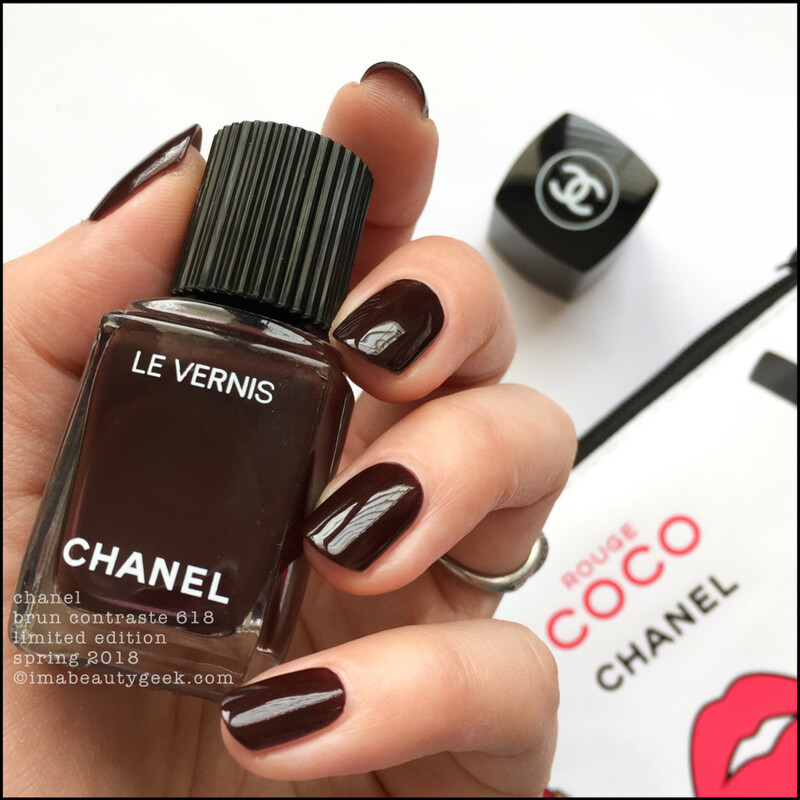 I know you thought I’d reach for my Girly Bits Hocus Pocus but when you’ve got this Chanel top coat in The Archives, you just gotta whip it out every once in a while. You’re glad I did. I can tell. 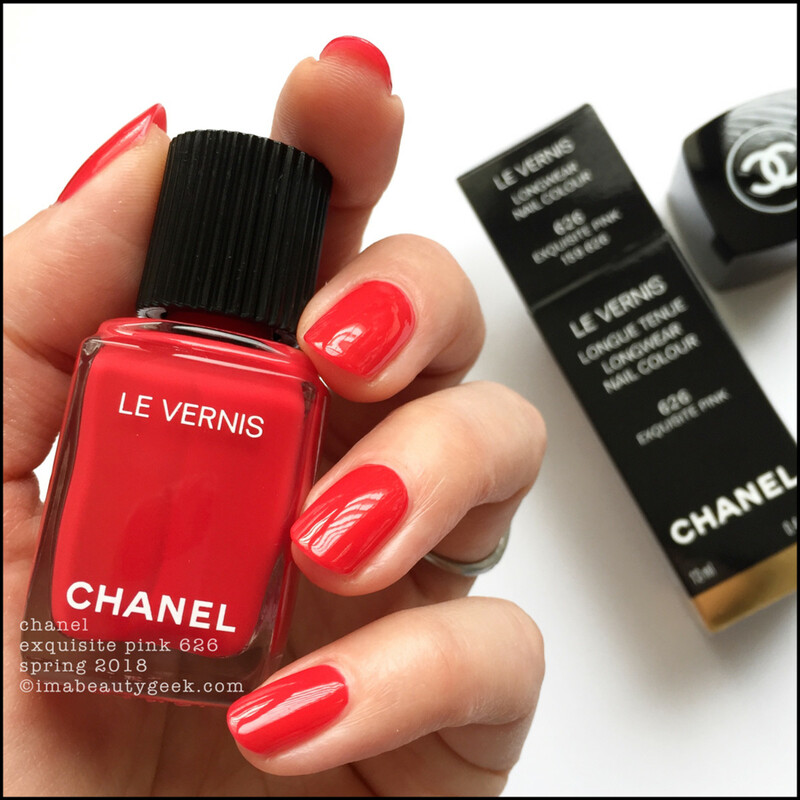 Chanel Brun Contraste 618 – limited edition (above). And finally, this. It’s simple, sophisticated Autumn in a bottle. Why is it showing up in Spring, as part of the new Chanel Rouge Coco Lip Blush launch? Prolly because it was on da runways and that’s how Chanel does. Do I care that it’s showing up now? Nope. Why? Well, it’s freakin’ snowing today so I’ll take this dark chocolate mocha and wear it just to spite Spring. That’s it! That’s all I gots! 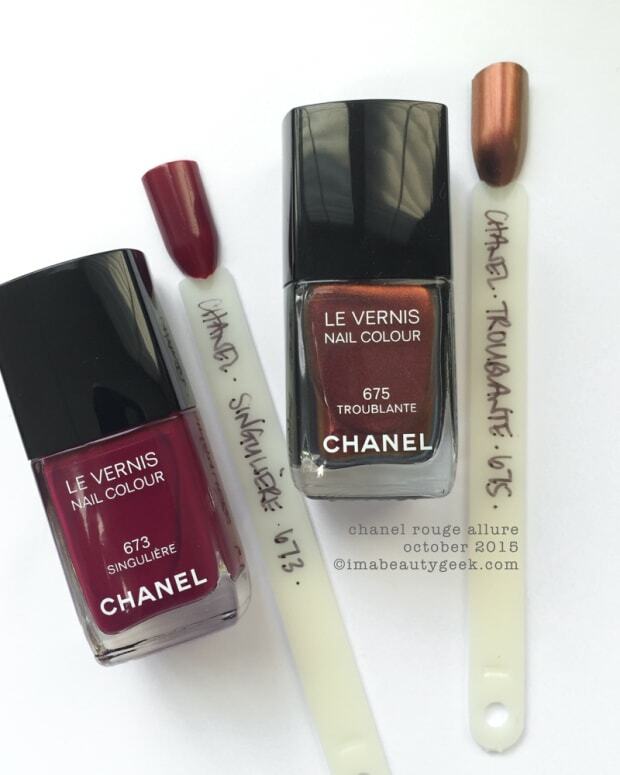 There are a couple more shades for this season (Chanel Violet Piquant 622 and Chanel Prune Dramatique 628), but they didn’t make it to mah desk. Hopefully at some point they will and then I’ll show ‘em to you! Beauty arcade: Chanel Coco Game Centre pop-up at Holt Renfrew on Bloor St. W in Toronto until April 15th. 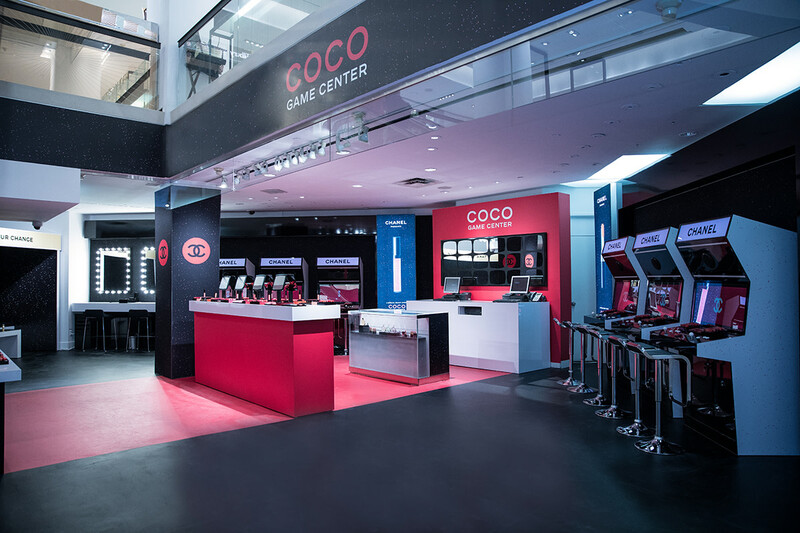 Aaaand if you&apos;re in Toronto, you&apos;ve got until this weekend – April 15th – to check out the beauty-arcade-style Chanel Coco Game Centre at the Bloor St. Holt Renfrew! And now I’m off to get me a Sausage ‘n Egg McMuffin with a hashbrown and a cuppa coffee. Happy day, everybody! Where can you get yours? In Canada, thebay.com has all these new shades. 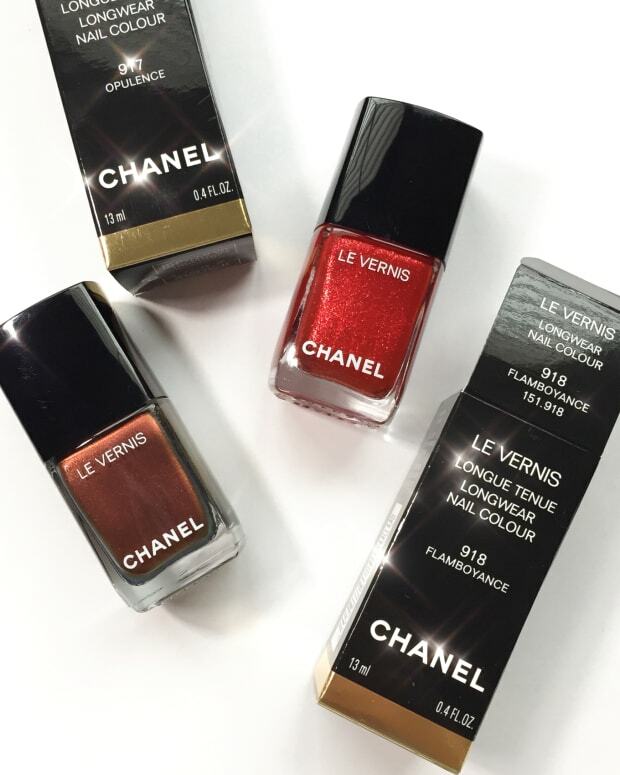 In the USA, nordstrom.com has five of the new releases (no Rose Néon, which is odd – but you can get that from chanel.com).